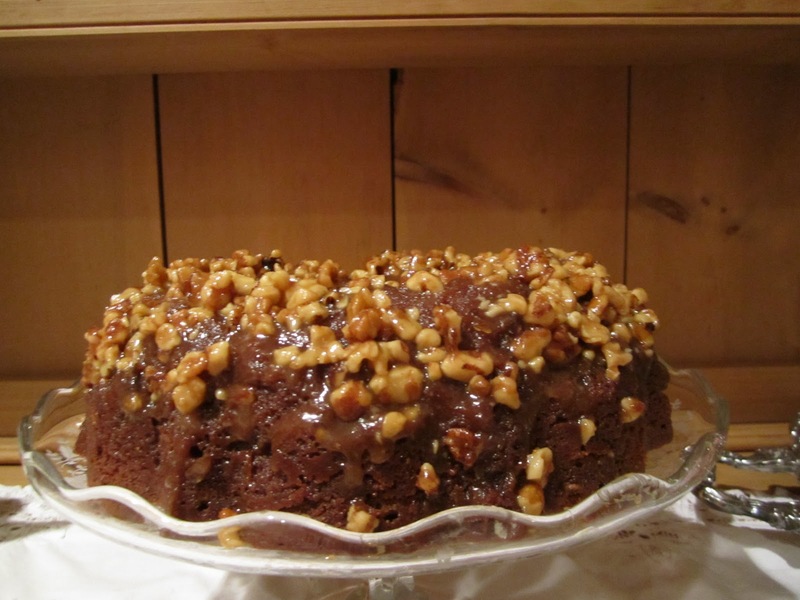 One of the first cakes I remember making after I got married was this Chocolate Nut Upside-Down Cake. A favorite of my husband and family. 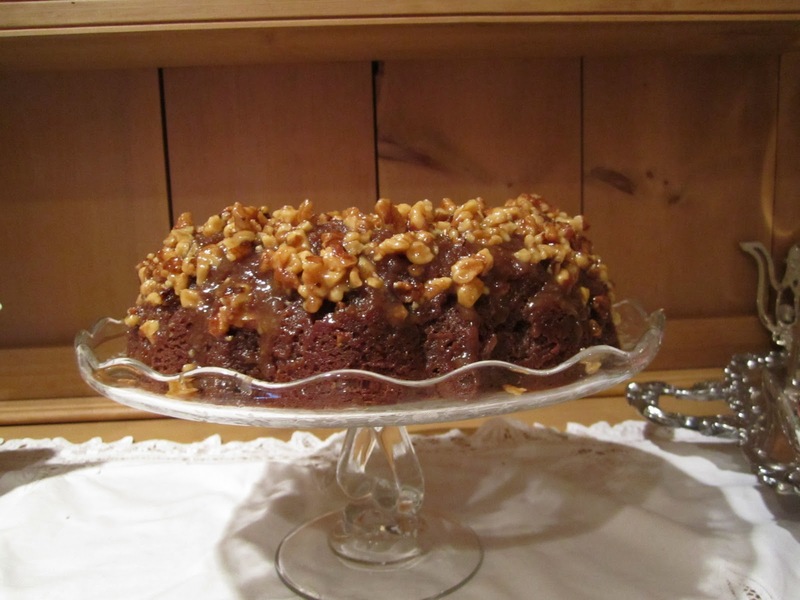 What could be better than a wonderful fudge cake with a delicious caramel nut topping. The best part is this cake is not only delicious, but very easily to make. I promise, just try and you will see!. 1. Melt 4 tablespoons of butter in a small sauce pan; stir in brown sugar; heat until bubbly. Stir in corn syrup and cream; heat , stirring constantly, just to boiling. Add nuts; pour into a generously greased 10-inch bundt pan. Let stand while preparing cake batter. 3 Beat remaining butter in a large bowl, until soft. Gradually beat in granulated sugar until well blended. Beat in egg yolks, chocolate and vanilla until thoroughly blended. 4. Add flour mixture alternately with milk, beginning and ending with flour. Beat egg whites in a small bowl, until stiff; fold into cake batter. Spoon batter evenly over nut mixture in pan. 5. Bake at 350 F 45 minutes or until wooden pick inserted in the center of the cake comes out clean. 6. Loosen cake from edges with a small knife; cover pan with serving plate; invert; shake gently, then lift off bundt pan. Arrange any remain nuts or syrup clinging to pan onto cake with a rubber spatula. Because I love to bake, I collect cake dishes and serving plates. For cakes, I just love pedestal cake dishes that are available in wonderful and beautiful designs. You can start with a basic glass pedestal cake dish which is beautiful as well as practical. Then just be on the look out for all different dishes from new to vintage. Lovely cake plates can be found in all price ranges. Some of my best finds are lovely dishes for inexpensive prices at antique stores and flee markets.